After a full year of inactivity here at ESR (save for screening dates, and attending tradeshows), we're back in print with two more releases. Our -gulp- twenty-third issue of The Eclectic Screening Room (or ESR for short) returns to its roots. For the first time in five years, ESR has released an issue not devoted to one central theme, offering a more -ahem- "eclectic" grab bag of articles than recently seen. 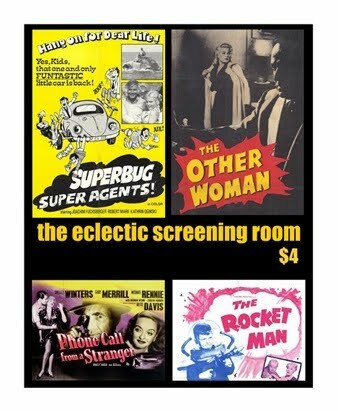 To start the issue off with a bang, Brian Random offers his wonderful piece on the Superbug films, made in Europe in the early 1970's to cash in on the "Herbie Love Bug" craze. Then yours truly offers a couple of nostalgic pieces on good old Hollywood melodrama in 1952's Phone Call From a Stranger, and one of my favourite films, 1977's Citizens Band (also known as Handle With Care). The centerpiece of the new issue is a lengthy piece discussing a dozen films by Hugo Haas, an unfairly maligned and all but forgotten B-movie auteur of potboilers in the 1950s and 60s. Haas wrote, directed, produced and starred in these films, which as history records, may be a fall from the grace of his work in his native Czechoslovakia, but there is clearly a great deal of surprises to be found in his American films, which, if addressed at all in print, have usually been regarded as "camp". Although the new ESR was designed without a particular theme in mind, serendipitously it became an indirect look at the 1950's, with the pieces on Haas, Phone Call From a Stranger, and the closer, "They Came from the 1950's", in which Rob Craig offers up four reviews of fantasy films from the decade. These pieces by the way were extracted from a much longer body of work, It Came From 1957, which discusses over 50 fantasy films released in that year. The four films in the ESR issue are actually titles which were produced earlier in that decade, however re-released that year, and deleted from It Came from 1957, as that book now entirely focuses on titles initially released in that pivotal year. 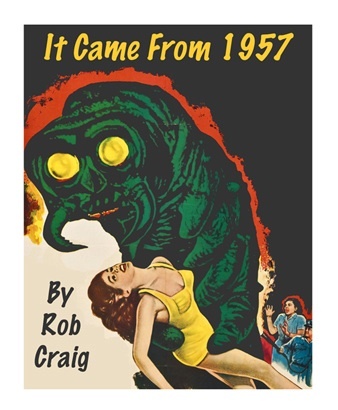 It Came From 1957 has over four-dozen analyses of fantasy films, all written by our old friend Mr. Rob Craig, in his typical revisionist fashion: sometimes knocking over sacred cows, while championing lesser known works of the period; all while correlating the work to the social tempers of the time- as issues of atomic energy, Communism, racism and the seeds of the feminist movement are all weaved into the text. Both of these titles are now available to order. The new ESR retails for $4.00 CDN, and It Came From 1957 sells at $6.00 CDN.